Musk Creek Farm owner David Kobritz has facilitated the future of another colt with stakes winning potential for Coolmore Stud. The Mornington based breeder pin-hooked Pierro for $115,000 as a foal and then on-sold him for $230,000 as a yearling. The Lonhro colt swept the Sydney 2YO Triple Crown in 2012 and was syndicated to stand his first season at Coolmore for a $77,000 service fee last year. Kobritz was the catalyst for another class act when Vero Beach scored a 7 length victory in the NMIT Maiden Plate (1100m) at Kyneton on Wednesday. He led under a hold and then accelerated when asked to extend by jockey Steve Baster. Vero Beach (3c Fastnet Rock — Bellevue Lady by Zabeel) made top price of $500,000 on account of Musk Creek (as agent) at the 2012 Inglis Melbourne Premier yearling sale. 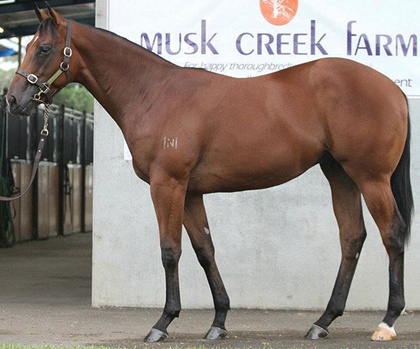 That was a huge mark-up on his pin-hook price of $145,000 as a foal at the 2011 Magic Millions National Weanling Sale. Vero Beach (pictured at the yearling sale) races for a syndicate headed by Coolmore’s Susan Magnier and is bred on the same Fastnet Rock — Zabeel cross as Kavanagh’s champion filly Atlantic Jewel.